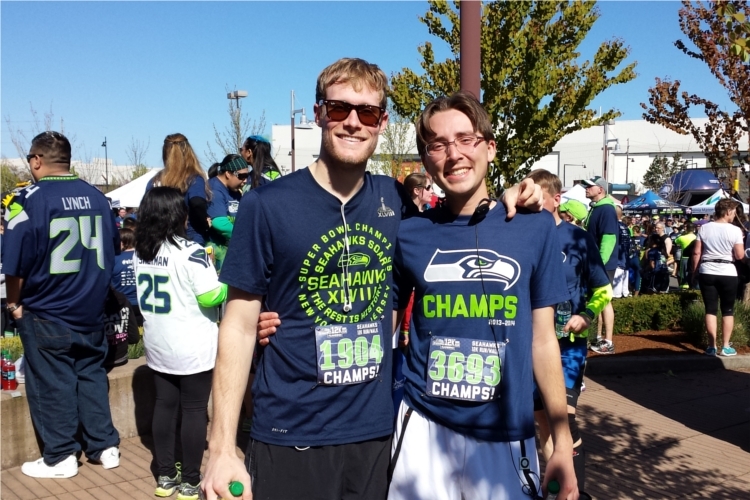 Today was the Seahawks 12K run. It was amazing! But also not so great in that my time was kinda slow. Earlier, I mentioned some goals… but then I got a little hurt a month ago and took some time off and never really quite got back to where I was in mid-February. I peaked too soon! Anyway, I was hoping for a pace a bit below 8 min + 43 sec/mile but I ended up running 8 min + 51 sec/mile. I guess this isn’t toooooo much slower, and conditions weren’t quite ideal, but I’m still somewhat disappointed. No (imaginary) medals for me this race! Oh well. Pre-run group photo: some of us ran a 12K, some of us ran a 5K. The little guy ran a 0.4K (he crushed it). Despite my somewhat lousy time, the race was still a lot of fun. We lucked out with the weather; it was warm and sunny and beautiful. The course starts at The Landing shopping center (in Renton) and goes up along Lake Washington (providing some fairly picturesque views) to the Seahawks training facility. You run around the facility, right by the training fields, and then back to where you started (it was an out-and-back race). The race was actually a touch more than 12 km… I think it was about 12.3 km. That disparity might not sound particularly significant, but when you’re running on the course it certainly FEELS like a big difference. The only semi-bad thing about this race was the number of people who ran in it. 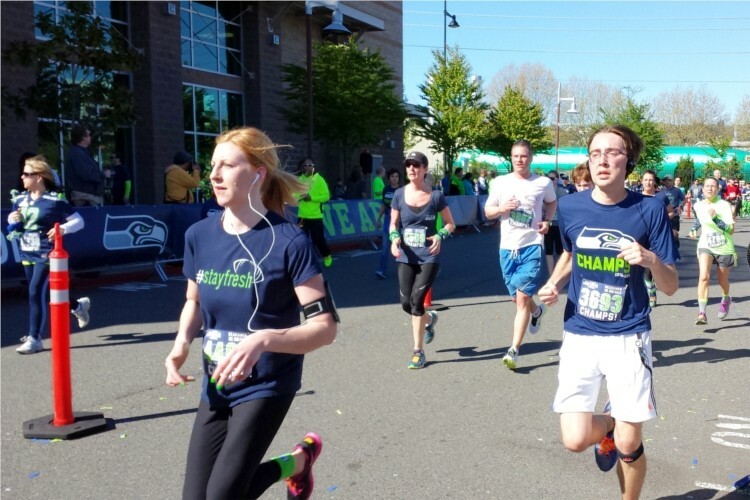 There were ~4,000 participants at this event last year (combined, for the 5K and 12K races). 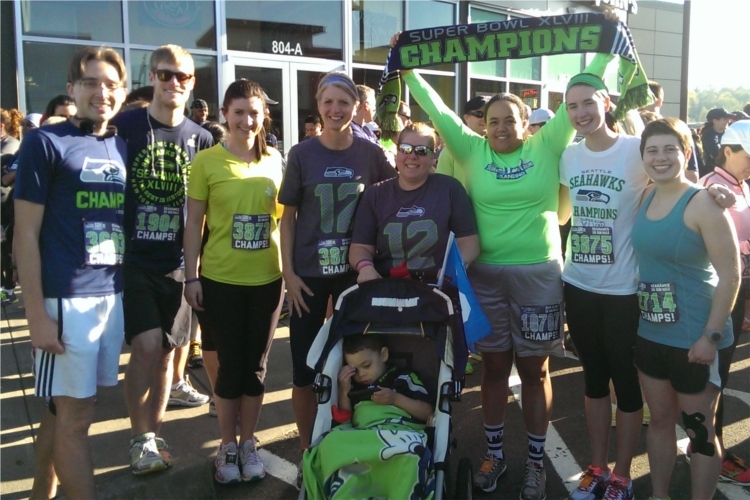 But this year, because the Seahawks just won the Super Bowl, the number of folks who signed up increased to 12,000! And ~6,000 of those participated in the 12K. This 300% spike in attendance resulted in some serious foot traffic… Although they tried to stager the start by releasing people in waves, this was largely unsuccessful. The last wave (which I was in) probably had ~3,000 people in it. It was nuts! The route was super congested for the first FOUR miles. This was kind of okay in that weaving your way through the crowd feels a little bit like a game and ~distracts you from the fact that you’re running for an hour. Also, you feel super cool when you’re passing a bunch of people. Unfortunately, all that swervin’ around does add some distance to your run and can tucker you out a little bit faster. There were also several instances where I got kinda boxed in all sides and just had to go slow for awhile. Another factor that threw me off a little was the fact that, for all of my practicing, I’ve been running at night. The last four months I’ve generally been out when temperatures were near 40 degrees (which I think is very comfortable). Today, it was ~55 degrees at 9 am when the race started. And sunny! It turns out that this ~15 degree difference is fairly significant… I was so hot! Between miles five and six there was a not small hill that we had to run up; I got super light-headed and I think I slowed down quite a bit (because I didn’t wanna tip over). I think that this stretch, in combination with the congestion, is probably what stopped me from achieving my time goal. But the dizzy feeling only lasted about ten minutes. Otherwise, I felt pretty okay today during the run. My hip and knee were (relatively) pain free. Post-run pictures are sweatier than pre-run pictures. After we finished, I crushed some Clif bars and a banana. I don’t generally like any kind of “energy” bar, but the stuff they were handing out today was delicious and tasted like Thin Mints. After we hobbled around in the finisher’s area for a little bit, we went and grabbed brunch at the Whistle Stop Ale House (a small restaurant nearby in Renton). I got some huevos rancheros. They were tasty. Now I’m gonna hang out on the couch and read/watch baseball! Today was a good day. *Thanks again to Stephanie for taking pictures! She was going to participate in the 5K, but shin splints have disrupted her runnin’ lately… however, she was nice enough to still attend as a spectator/photographer.